A Family Affair | American University Washington D.C.
As a Washington Semester Program student, Alexa Calaguas is following in her grandmother's footsteps. Grandparents frequently hand down family heirlooms, but they also impart wisdom. So when Evie Osterman spoke glowingly about American University's Washington Semester® Program, her granddaughter Alexa Calaguas took note. Osterman attended the Washington Semester Program in the fall of 1960. "It was the catalyst for the rest of my life," she says now. 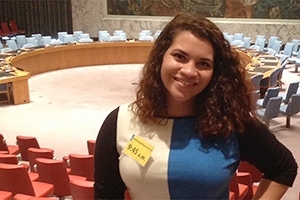 In 2014, WSP student Calaguas is following in her grandmother's footsteps. In 1960, Osterman was a politically-engaged, Boston-based college student looking to explore Washington, D.C. Then, at a propitious moment, she discovered the Washington Semester Program. "That fall was the election of John F. Kennedy. And so, if you're a political animal, it was a great time to be in Washington," says Osterman, who would work on the Kennedy campaign. She later attended Kennedy's historic inauguration in early 1961. "The [WSP] program changed my life because I decided that I wanted to move to Washington after graduation," she says. Like so many other Americans, Kennedy's famous words—"Ask not what your country can do for you, ask what you can do for your country"—resonated with her. She then took a job at the D.C. headquarters of the Peace Corps, which was headed by Kennedy's brother-in-law, Sargent Shriver. Osterman would spend the next 35 years of her life in the D.C. area. This semester, Calaguas has made the most of her time here. She's focused on international law, and she took part in trips to the World Bank headquarters in D.C. and the United Nations in New York City. She is also interning at the American Enterprise Institute think tank. "I find the program really interesting because it's not the typical structure of 'Oh, I'm going to take classes for the semester.' We get to hear from people in the actual fields that we're learning about," says Calaguas. She also praises the school's diversity, as WSP attracts students from a vast array of geographic locations. Her roommate is from Norway, and her class also includes students from Eritrea, Ghana, Japan, and Kazakhstan. "We're from all over, and it's great because we bring different perspectives from different countries and different universities," she says. This multi-generational participation illustrates the value of the Washington Semester Program. A plethora of opportunities await students when they come to AU for a semester. Students choose a program of study, such as global economics and business, journalism and new media, or public health. And students then take part in seminars, which are different from traditional classes. "What I think really distinguishes this program is that it combines rigorous academic study, practical learning, and on the job learning, as well as the networking skill building that you need to really have a productive career," says Carola Weil, dean of the School of Professional & Extended Studies (SPExS)—which oversees the Washington Semester Program. "It really is much more of a leadership development program than simply a summer or a semester or a period of time in Washington, D.C."
The professors have extensive experience in their chosen fields, and they maintain numerous professional connections in Washington. Professors use those contacts to invite senior-level speakers to WSP seminars, and students visit government agencies, nonprofits, media outlets, and other Washington institutions. "It is a much more intensive and immersive experience. We make D.C. our classroom," says Weil. Gilbert Klein is the interim director of WSP. He says guest speakers will give brief introductory remarks on a particular theme or topic, and this is followed by lengthier group involvement. "These classes are small enough that they quickly become discussions. And that's where the real value is. Students have a chance to sit there and ask questions to people they never dreamed they would be talking with," Klein says. A former national correspondent for the Media General News Service, Klein has taken budding journalists all over town. For instance, he recently had students meet with The Washington Post's managing editor for digital news, who talked about where the company is headed under owner and Amazon.com mogul Jeff Bezos. There is also a research project or elective course option. And through their courses, students get involved in other activities in the city. In professor Diane Lowenthal's course on American political behavior, WSP students developed an exit poll for the midterm election. Students fanned out to polling stations in D.C., Maryland, and Virginia on Election Day, and they plan to use the survey data as part of a final project. Students earn at least four credits through internships. Six to eight weeks before the semester starts, students get access to WSP's database of internship possibilities. WSP will help students with résumé and cover letter writing. "You will learn how to look for an internship, i.e. how to look for a job. You will learn how to have an informational interview," Weil explains. "You will learn how to present yourself properly, how to communicate effectively, and what to do if you don't get what you wanted." Klein highlights the breadth of internship destinations for journalism students this semester. For instance, several students are getting video shooting and editing experience at the National Press Club's Broadcast Operations Center, and another student is reporting on Capitol Hill for the Washington bureau of Ohio newspaper The Columbus Dispatch. Other intern spots include Al Jazeera, WTTG FOX 5, PolitiFact, Street Sense, and Voice of America. And plenty of students go on to have successful Washington careers. Notable WSP alumni include 2012 GOP vice presidential nominee and Rep. Paul Ryan, R-Wis.; former Health and Human Services Secretary Donna Shalala; and former Gov. Michael Dukakis, D-Mass., the 1988 Democratic nominee for president. Osterman now lives with her husband in Sarasota, Florida. Calaguas is a junior at Rollins College in Winter Park, Fla.—only a two-hour drive from her grandmother. Calaguas is already well-traveled: She visited a number of European countries through a semester-at-sea program, and next fall she's planning to study abroad in China.